I was sent these to try a long while back so this post is a bit overdue but anyways. A unique blend with non-greasy natural almond and mineral oils that are so fine, they are rapidly absorbed to deeply nourish and replenish essential nutrients. It’s next generation nourishment for beautifully smooth, soft, shiny hair. This looks like a tooth paste due to it being a 2in1 and the colour nicely explained on the top of the product. The gold ribbon being the treatment and the white being the conditioner. You apply this product from the ear down to the tip as this is the driest part of the hair it says to leave on for 1 minute but I like to leave it on for longer while in the shower so the heat will open the hair follicles for better absorption and also giving it more time to really work into the hair. This product is great because it works really quickly and it is also a 2 in 1 so you don’t need to go out and buy a separate treatment and conditioner. The packaging is a lovely gold and usual dove white. The information on the packaging is to the point and informative. My hair is oily at the roots and dry at the tip and is frizzy and has a lot of volume. after I washed my hair it felt silky and smooth and smelt amazing. Also it was great as it did not make my hair oily as I thought it would. I didn’t like the fact that it gave my hair so much volume as my hair is fluffy on its on so I want something that would weigh down my hair. The range contains very nice natural oils of almond an coconut as stated in their ingredients. I also noticed my hair being less fizzy as what it claimed to do. It’s affordable and really does what it claims to do. 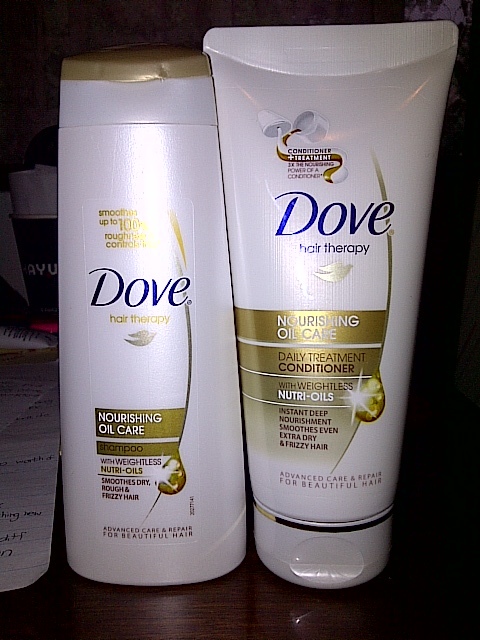 Really recommend this to anybody who has dry,frizzy or rough hair.